Halfling Snipers O.O.S. 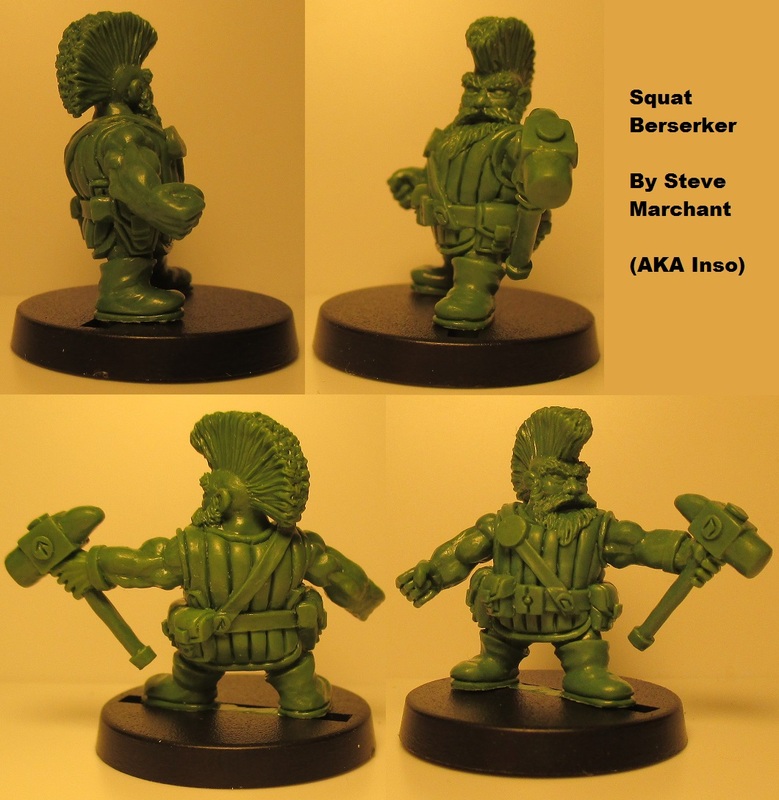 and Squat Berserker. As of now, the Halfling snipers are no longer for sale and will not be sold on this Blog again. This is because I have sold the greens to CP Models. CP Models will be casting them up in metal, at some point in the future so if you want to get hold of them, watch their site for details. 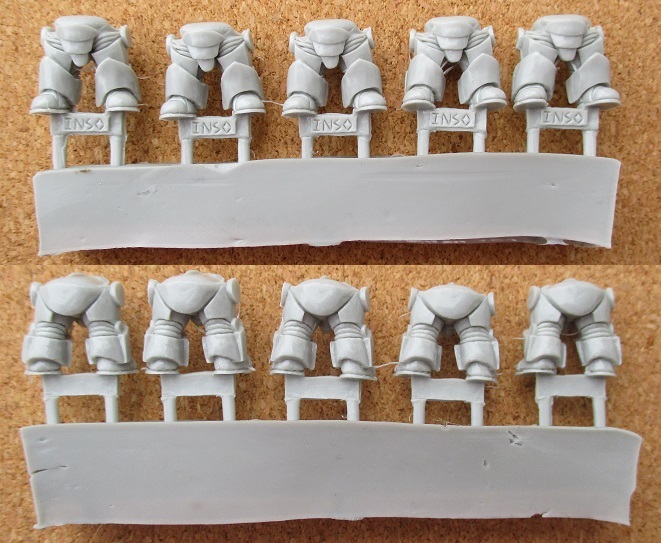 For those that have purchase some of the Halfling Snipers, thank you for your custom. It is a Squat Berserker and is currently entered into a sculpting competition on Facebook. Once the dust clears, I will be looking to cast up a batch of them for sale... so watch this space. Exo Armour Legs Out of Stock. As of now, there is no more stock of the Exo Armour Legs. I will not be casting any more so if you didn't get any, then you won't be able to get any from me. That said, I have had an offer for the original green so there is a likelihood that someone else will be casting them up in the future. When I find out more, I will share it here. It has been a while since I last posted but I thought I'd let everyone know that there are only two sets of Exo legs left for sale and when they are gone, they are gone. There are still plenty of Halfling Snipers available but depending how long it takes to shift them, they may not return once they have been sold. Demand will dictate whether I need to get them re-cast. With that in mind... and with Christmas fast approaching, maybe now is the time to put on order in... or not... it's your choice. The Halfling Snipers will be available as a set of five for £12.50 (+ Postage). 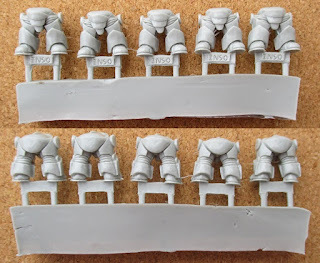 The Exo Armour Legs will be available as a set of five for £10.00 (+ Postage). The Halfling Snipers will have 25mm slotta bases supplied as standard. 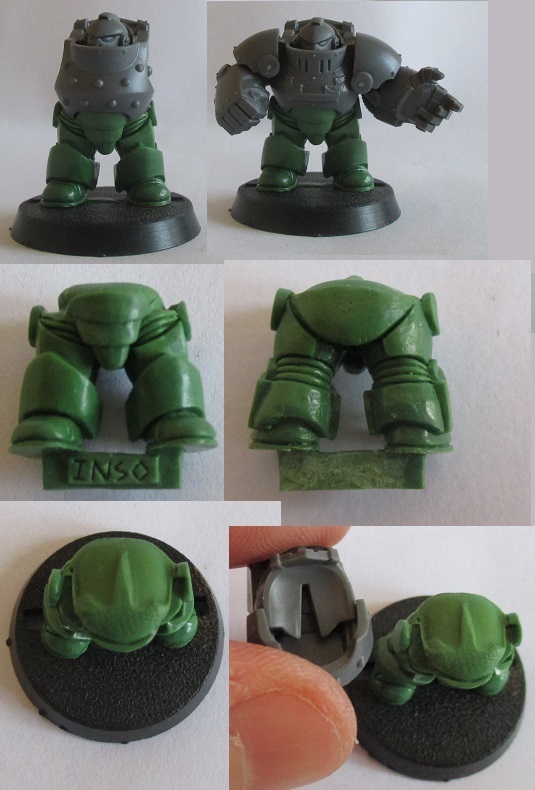 The Exo Armour legs will NOT have bases supplied. I have bought a lot of 'large letter' boxes to keep postage costs down but will always send out miniatures as 'signed for'. I will send to countries outside of the UK (apart from Italy - I have sent many parcels there and NONE of them have ever arrived so I refuse to take the risk any more... unless a 'guaranteed' service is used and that would be extremely expensive) and postage will be at cost. I will be absorbing the packaging costs so any postal charges will be at cost (Royal Mail). I currently have 26 sets of snipers that are ready to be sold and I will be checking through the Exo Armour Legs to see how many I can sell. At the moment, I will have to ask for patience from anyone wishing to purchase any of these because I have 'real life' commitments that are currently dominating my life; namely a family member who has terminal cancer. That means that I can't guarantee to get to the post office very regularly. as a result, I will notify people when I have posted stuff so that they can get an idea of how long they will have to wait. I am hoping that I will be able to get things rolling next week (from Tuesday or Wednesday) so if you are after some snipers or Exo Armour Legs, then you shouldn't have to wait much longer now. 1 - You email me with your requirements and where you are in the world (email address will be posted next update). 2 - I send you a reply with cost, including postage. 3 - You send me a reply accepting the cost and providing your Pay-Pal address and your postal address (or telling me that you don't want to continue). 4 - I send you a Pay-Pal payment request. 6 - I send it out as quickly as I am able. Because this is a very small scale operation, I won't be investing in a shop just yet... I need to see how things go first. If this is a roaring success, then I may take the plunge but it is early days yet. This week has seen a little more progress on the Halfling snipers. Obviously, I have to start from scratch when it comes to getting my work onto the market at levels beyond a single miniature so I have purchased postal boxes, bubble wrap, plastic bases and am currently awaiting the arrival of some labels. In addition, there is the need to display a product so that people can actually see what you are trying to sell. With this in mind, I have also ordered a light box so that I can try and get some better pictures put together. The picture above shows why I really need a decent light box to photograph my products. I have chosen the colours so that the bases contrast the camouflage so that you can see what the miniatures are like. Obviously, when given a decent base with colours that match the camouflage you chose, they will look far more appropriate. Everything is getting closer to fruition so keep watching this space.